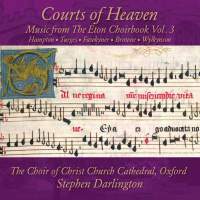 This third helping of Eton Choirbook music will gladden all those interested in this fascinating repertory. The commitment shown to this series by both label and performers alike is anyway remarkable in these straitened times. Moreover, it has contributed to the discography in two important respects: first, by almost single-handedly championing the performances of this repertory with boy trebles, the voice-type for which the treble parts were composed; and second, by focusing more than any earlier ensemble on previously unrecorded pieces. This is not merely a matter of ‘filling in the gaps’. It was more difficult to evaluate the major Eton figures (chiefly Browne, Lambe, Davy) when the music of their lesserknown colleagues was accessible only on paper; besides, Darlington’s selection is of such quality that the gap between major and minor figures is rather narrower than I, for one, had supposed. A case in point is Fawkyner, whose entire surviving output (all of two pieces) can now be heard thanks to this series. The programme alternates antiphons with trebles and without. The stamina shown by the trebles is at all times remarkable, and this particular crop raises the recording nearer to the level of the first in the series than did the second. Their resilience might have been taxed less if tempi in duple-time selections had been just a touch faster, but in general the balance between intricate detail and overall sonority is very well rendered. Finally, a note to all you John Browne ‘completists’ out there: here is the first recording in nearly 50 years of Browne’s O mater venerabilis. A bonus track from the sessions not included for reasons of space (Lambe’s Nesciens mater) is available on the major streaming sites.